"Unprecedented openings for non-engineers result from industry growth and shortage of skilled men." 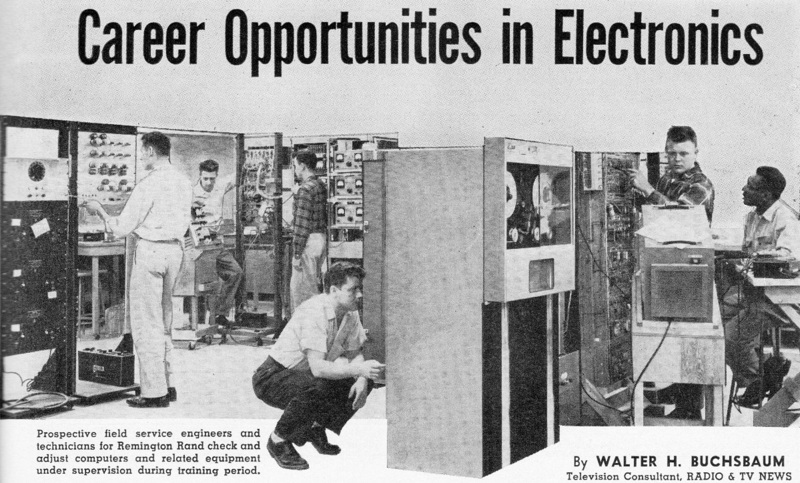 Thus goes the subtitle for a magazine article pitching the promises of a career in electronics technology. It came at a time that predated throw-away everything rather than attempting to repair stuff. It was before the term 'personal device' (aka 'throw-away') had been coined. It was before placards warning "No user serviceable parts inside" were routinely stuck on practically every item purchasable in a department store. It was a time when people took stuff apart to see how it works, and were actually able to figure it out because parts were large enough to see and actually moved, and even printed circuit boards could be deciphered since trances were on the two outside surfaces and components had leads. The radar systems I worked on while in the USAF are a perfect example of the transition between component level circuit repair and module/board swapping. The 1950s-era vacuum tube portions with point-to-point wiring required real troubleshooting and repair skills. 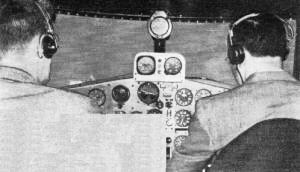 The newer 1970s-era transistorized IFF synthetic radar (the system that puts alphanumeric squawk codes on the air traffic controllers' displays) were designed to be troubleshot to the board level, but often if time permitted we to the initiative and went onto the PCB. We figured if we ever found ourselves in an actual battle situation with a crippled supply line that it would be good o have honed the skill. Fortunately, our shop NCOIC had the same philosophy. Yeah, I know, "Stop living in the past," you might say. I don't, and I enjoy the benefits of modern technology, but I do miss some of the simplicity of yesteryear. Unprecedented openings for non-engineers result from industry growth and shortage of skilled men. The most serious obstacle to the current expansion of our technology is the shortage of technically skilled people. Educators, industrialists, and government officials are continually deploring the lack of engineers and scientists, especially in those fields which have grown most rapidly. 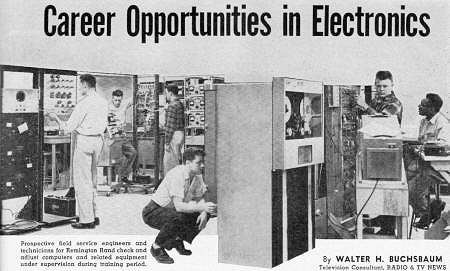 The electronic industry has developed so fast since World War II that the manpower problem is now quite acute. In this field, the shortage of trained personnel is further aggravated by the rapid growth of the industry and its branching out into so many diversified fields. 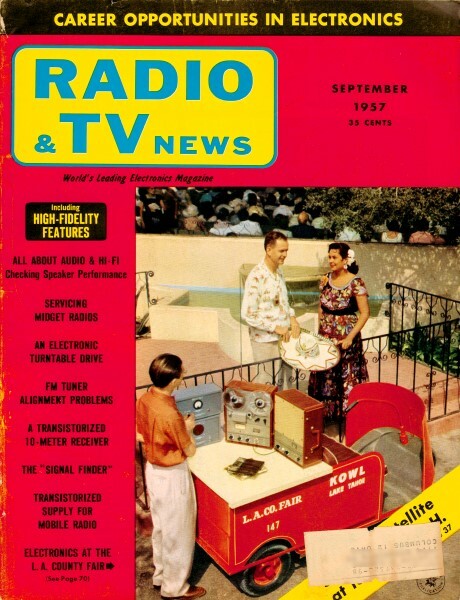 In 1938 the radio-receiver manufacturers were the major employers of electronic engineers and technicians. Today aircraft companies, business-machine manufacturers, and others dominate the employment advertising columns. It is difficult for one not actively engaged in this gigantic, many-faceted field to realize the tremendous variety of work going on. Some old-time radio amateurs are amazed when they see a K-band radar unit or an industrial heat-sealing machine and realize that, basically, these devices are related to their own rigs. Hi-fi enthusiasts are often surprised to learn that amplifier characteristics, similar to those in their home music systems, are also measured in computing amplifiers, servo systems, and radar display devices. The current shortage of technical personnel in the electronics field cannot be solved overnight by any magic formula. It can be relieved gradually by increased emphasis on science teaching in elementary and high schools, by an increase in various scholarships, and, of course, by further improvement in the salary scale of both professional and non-professional people. Engineering salaries have been increased considerably during the past five years and the wages of technicians have risen similarly. The trend has shown no signs of petering out. This chart indicates the wide variety of career opportunities open to technicians with electronics background and experience but without degrees. Numbered grades are explained in text. Much has been written recently about steps taken to increase the supply of engineers. One of the most practical steps proposed has been the use of the available engineers in the type of work for which they are particularly qualified and only in those positions. This means that posts have to be created for engineering aides, technicians, and other personnel-people who have some but not necessarily all of the technical qualifications of the engineer. Many companies have instituted reorganizations in this direction. The "help wanted" ads in this magazine are witness to this trend. It is not enough to upgrade or relocate technicians and engineers already employed in the industry. Rather, additional personnel is needed. Some new employees are often recruited from the graduating classes of technical schools on various levels, but a great source of skilled, competent personnel still lies untapped. The circulation of this magazine, for example, exceeds 250,000 copies a month. In this vast group alone there will be some qualified individuals who are not yet employed in the electronics industry. There may be many others who are working in some branch where their skills are not fully realized. Those who have some technical knowledge, but for one reason or another, are working outside the industry; those who are dissatisfied with their present positions in the industry; those who want to get ahead; those who are thinking of entering the electronics field will all find some helpful information in this article. In the accompanying table, we have tried to show the variety of career opportunities open to non-graduate personnel in the electronics industry. Engineering graduates today are in a favorable position but technicians have generally been wooed much less vigorously and only by a small segment of the industry. For that reason many qualified non-engineers feel that their services are not in demand or that only such popular fields as TV servicing and hi-fi work are open to them. The table presented here should serve to show the true possibilities for a career in electronics for other than graduate engineers. By common understanding, a graduate engineer is a person having at least a bachelor degree in electrical engineering or some related field. In the table, we have considered only those jobs which do not require any college degree and which can be filled by persons with less knowledge and experience. (In some positions, an engineering degree is preferred but equivalent experience is acceptable. Such jobs have not been included.) The table of career opportunities presented here is based on average earnings and average ability. We know of many instances where non-graduates have achieved high engineering status by practical knowledge, experience, and outstanding ability, and now hold top positions in the electronics industry. The same holds true for civil service, where tests are often substituted for college education. To give some idea of technical knowledge and its value in a job, we have selected eight arbitrary levels of competence. It is assumed that the knowledge or skills of lower levels are possessed by a person rated at a higher competence level. When a technician is capable of simple circuit design, for example, we assume he knows how to solder, how to read the color codes, and understands basic radio theory. Naturally the list cannot fit each individual exactly, nor are the grades shown under "qualifications" in the table fixed. Often a person of lower qualifications is accepted for a job because he shows promise or is concurrently engaged in some study which will increase his knowledge. Grade 1 - Knows wiring and assembling; can operate simple machine tools. Grade 2 - Understands circuit diagrams; knows electrical components, units, and systems of measurement. Grade 3 - Knows radio theory as taught in trade schools; can service equipment according to detailed instructions. Grade 4 - Can construct and test simple devices from circuit diagrams. Grade 5 - Can design simple circuits from technical texts; knows algebra and trigonometry. Grade 6 - Has graduated from a 2-year course at a technical institute. Grade 7 - Has 5 or more years experience as a technician in lab work or servicing or has equivalent military experience. Grade 8 - Has 3 or more years experience as a junior engineer in the industry. 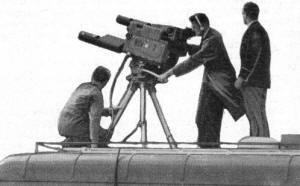 TV broadcast technicians and cameramen, as part of their training, use mobile equipment during a practice pickup. An engineer pans the camera of a self-contained flying TV transmitting station built into the cabin of a helicopter. Pre-flight check of air electronic gear. A technician in a naval radio station operates code perforating gear. 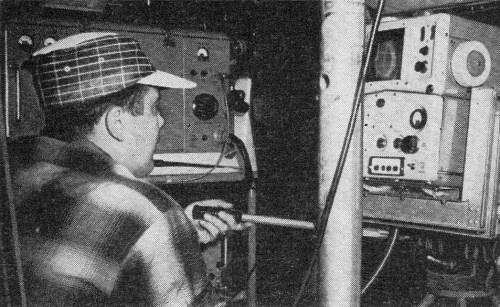 A sound technician, at work in a studio control booth, is adjusting program material on a broadcast audio console. 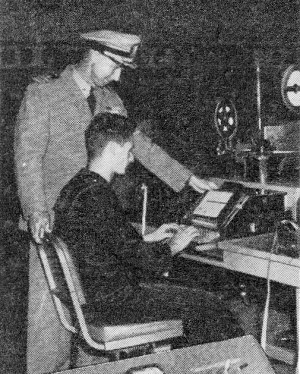 George Bryan demonstrates an experimental model voice-operated radio transmitter at the Signal Corps Engineering Laboratory. The impact of the sound waves from a speaker's voice powers the electronic signal. Jobs involving interesting new equipment such as this transmitter are open in various branches of government service. The grade into which an individual falls at this time is not necessarily a permanent limitation to how far he can go: there are many ways in which he can improve his qualifications while working at a particular level so that he may pass on to higher positions, especially with prevailing conditions in the industry. Many of the larger manufacturing and developing firms conduct schools for technicians which, after a few years' work, lead to better positions and even recognition as engineers. Most electronics companies grant time off with pay for employees attending evening school. Lockheed Aircraft, for example, permits qualified technicians to attend college during two days a week while working the remaining time at regular pay. Tuition for relevant courses is paid for entirely by many employers, while others pay a portion of it. The positions listed in the table are by no means all that are available in the industry, but rather the most common and most accessible jobs have been selected. There is an entire range of jobs open in the electronic sales field, for example. Here the important qualifications include sales ability and some technical knowledge of product. The salesman for a parts distributor will have to know something about electronics in order to understand, at least roughly, what the various parts are. When selling relays, the salesman should really know something about relays as well as sales. Usually an alert person can learn enough about a product in a short training period and, if he has sales ability, can do very well. Another area in the electronics industry in which many chances occur is that involving various clerical and administrative functions. In each instance, a knowledge of at least some branch of electronics is helpful, but the major qualifications are of a different nature. The expediter or general office worker who has some background, say, in amateur radio, will easily fit into the purchasing, administrative, or stock-control department of an electronic firm. Such positions generally pay slightly better than general office work but, since they are not really of a technical nature, we have omitted them from the table. We have also omitted those positions which are found in any other manufacturing or servicing firm, such as accountants, office managers, carpenters, painters, machinists, and electricians. In the table we have listed most of the active fields in the electronics industry and have shown what positions, duties, and approximate wages are offered in each. We have used the field of "Electronic Equipment Manufacturer" to illustrate in some detail the various positions available with companies making such specialized electronic equipment as business machines, radio, hi-fi equipment, etc. The "Electronic Equipment Manufacturer" may be a firm specializing in making test equipment for other manufacturers, an aircraft firm now engaged in developing its own electronic flight control equipment, or a division of a locomotive factory engaged in making railroad electronic gear. It is impossible to list all types of firms which have some electronics department, but it is a safe bet that almost every sizable manufacturer in any field either has or soon will have one. We know of textile firms which have electronic labs and cigarette manufacturers, glass makers, lumber companies, food processors, breweries, and practically every other industry have connections with electronics today. 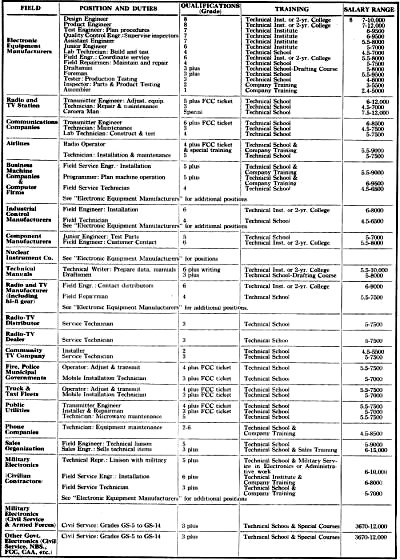 In addition to the fields listed in the table, any other company which has an electronics department will have jobs for technically qualified personnel, but usually those companies cannot offer the inexperienced person as much training or advancement as the type of organization listed in the table. A few words might be said about the annual income given in the table for various positions. These figures are average and do not take into account regional variations, overtime, travel pay, relocation allowances, and other benefits. In general, the fringe benefits offered are very similar throughout the industry. Hospitalization policies, insurance, vacation, and sick leave are universal. In many places, tuition, retirement funds, and additional insurance are provided. There are two important occupations which require some knowledge of electronics, but also lean heavily on other talents. One is that of the technical writer, who is presently in short supply. This position requires some technical knowledge and an ability to write factual accounts. Straight forward exposition is more important than ability at fiction or poetry. The other is that of draftsman. This usually requires that the person has taken a course in drafting, at least. Some background in mechanics often is helpful to obtain promotions from draftsman to designer, a job usually performed by mechanical engineers in most manufacturing setups. Enticing as the various career opportunities in the electronics industry are, they cannot be achieved without some training. In general it is safe to state that the more training a person has, the better his job and the higher his pay will be. It is, as was shown before, often possible to get additional training while working in the industry. However, in order to start, some previous background is important. We know of one young man who started 12 years ago as an assembler, being taught on the job how to use a soldering iron, and gradually, through correspondence school and, later, evening college, obtained a master's degree. He now is a department head at a large military electronics firm. Such careers are open to the ambitious and able person in almost any field, but the rapid growth in the electronics industry tends to encourage such advancement. To young people of high-school age we would advise, if possible, attendance at a vocational high school. If this is not feasible, at least take as many physics and mathematics courses as possible in the school you are attending. Correspondence courses in radio and TV theory are invaluable in getting started in this field, although they are of less value to an employer if the applicant does not have any practical experience to go with the theory. Today many firms realize that a person who takes a correspondence course and then actually starts servicing radio and TV sets shows not only technical ability but aptitude and determination which recommend him for further training. Such courses are a good start for an electronics career, but should be backed up with practical experience as soon as possible. An alternative to correspondence courses or supplementary to such training is attendance at a trade school teaching some branch of electronics. At the present time, there are a number of technical schools that offer a six-month course in radio and an additional three-month course in TV, coupled with construction and testing of actual receivers. Such courses are particularly valuable for the person who did not graduate from high school or whose aptitude for any form of mathematics is slight. Technical institutes offer, in addition to shorter courses, a full two-year course which is equivalent to at least two years of college work. This type of education is just a little short of an actual engineering degree in that it gives the student sufficient theoretical background to understand almost all engineering literature and permits him to use manuals and references for actual design of electronic equipment. The graduate from one of these two-year technical-institute courses will find ready employment and excellent prospects for advancement. It should be pointed out, however, that this type of training introduces the student to basic calculus, algebra, vector analysis, and complex numbers as well as to electromagnetic theory, physics, and some optics. In addition to technical institutes, there are also junior colleges which offer two-year courses, some giving a degree of Associate in Science at graduation. Another means of getting a technical background at a higher level is provided by the engineering colleges which offer part or all of their curriculum by mail, usually with some provision for a short residence at school prior to graduation. Such training is generally not accepted as equivalent to a full four-year engineering college, but it will qualify the graduate for many good positions in the electronics industry. 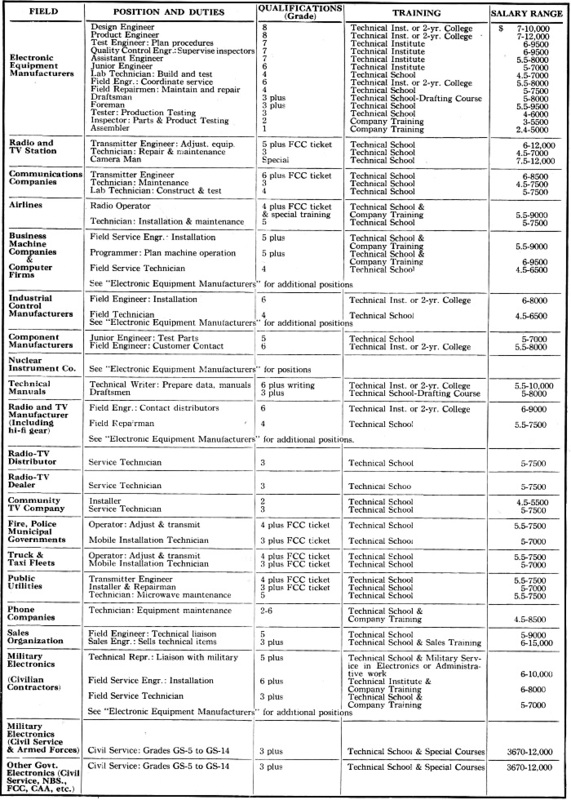 Many states sponsor or offer vocational training in some branch of electronics and, depending on the length of study, the person graduating from such a school will be qualified for various ones of the career opportunities listed in the table. The electronics training offered in the armed services is rather specialized, but gives a good background and often serves as the stepping stone to further training and better jobs. In some instances, it is possible to utilize military training to the fullest by working for a firm which makes the type of equipment for which the service training was given. We know of quite a few technicians, field service engineers, and junior engineers who are currently working for a civilian contractor on the same type of radar gear, fire control systems, or other devices which they were taught to operate during their military service. Whatever the origins of a person's technical knowledge may be, unless this knowledge is kept up-to-date, it can quickly become useless. 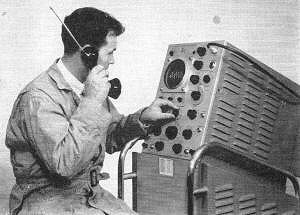 The old-time radio amateur will hardly recognize some of the subminiaturized components, novel circuitry, and plug-in assemblies which make up transmitters today, even though basic radio theory has not changed. Probably the best way to keep abreast of new developments is by reading. Keeping up with technical magazines, books, and manufacturers' literature is indispensable for everyone in such a fast-moving industry. This is recognized by management and it is customary to circulate periodicals and other literature to all technical personnel. Most fair-sized companies maintain technical libraries, and reading up on something is not considered a sign of ignorance but rather an indication of professional procedure. The value of studying textbooks at home, over and above any courses, cannot be over estimated. Anyone in the electronics industry who wants to get ahead should devote at least a few hours every week to reading some technical literature. Aside from the direct information it presents, it also trains the reader in the logical thinking required in any technical work. In conclusion, we would like to urge those with some qualifications who are not yet a part of electronics to enter it professionally, and also encourage those who are in it already to investigate the possibility of advancing themselves, for their own good and for that of the industry. Our investigations indicate that your present work is not making full use of your abilities and that you are ready to advance into more difficult but also more satisfactory work. Support for this conclusion is provided by the personnel manager of a well-known electronics firm: he confides that 90 percent of all job applicants under-rate themselves as far as technical ability is concerned. His estimate is substantiated by the face that practically all technical people in his organization have achieved substantial promotion during the first year. While increasing technical knowledge is important to career development, the environment for acquiring while working in the industry could not be more favorable than it is now. Editor's Note: Readers of this article will also be interested in "Employment in the Computer Field" and "The Men We Hire," which appear elsewhere in this issue.